Congratulations to Scott Wright for being the 2014 recipient of the Shield Award from the Saskatoon Fire Department. What a great way to celebrate National Volunteer Week! Scott Wright was born into search and rescue. His father was a helicopter pilot in the Air Force and Scott grew up hanging out with SAR techs and being used as a spotter during search exercises. As a teenager living in British Columbia, he was involved with the Coast Guard’s Marine Search and Rescue. Scott moved around the country a lot before setting down in Saskatchewan. In each place he lived he always looked for opportunities to contribute to the community, whether it was through search and rescue or as a counsellor at crisis intervention or sexual assault centres. In 1994 Scott was working in the Tisdale area and became involved in the search for young Ashley Krestianson who tragically lost her way and her life near that community. “It was a situation that said we really need to do something different,” says Scott. And it resulted in the formation of the Search and Rescue Saskatchewan Association of Volunteers (SARSAV). In 2004 when Scott and his wife, Cindy, were members (and he was President for two years) of Search and Rescue Regina, he decided it was “time to step up.” He became trained as a Search Manager and is now an instructor of the Search Manager Course. His daughters Laura (17) and Katrina (15) have been training exercise “search subjects” since they were about three years old. Scott claims he was “dragged” to his first SARSAV meeting by Bill Baynes but yet he took on the role of Secretary at that very first meeting and has been on the board ever since as Secretary, President or Director. 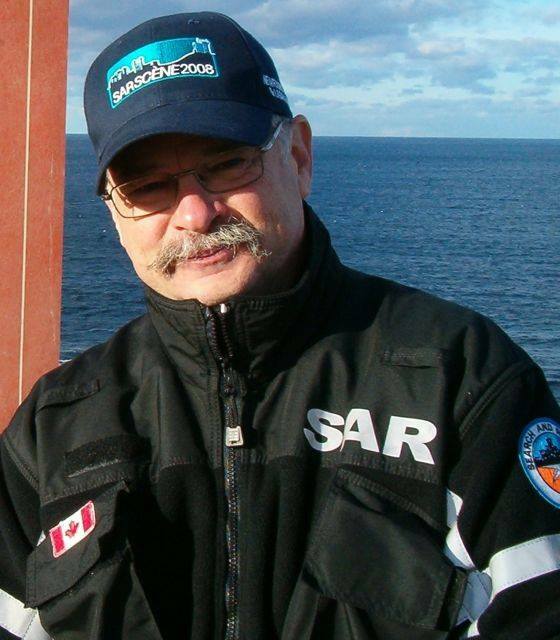 As if that wasn’t enough, Scott was Secretary of Search and Rescue Volunteer Association of Canada (SARVAC) for seven years, is now the Vice President and chairs a committee that is developing CSA standards for Ground Search and Rescue. When Saskatoon Search and Rescue started in 2008, Scott’s experience was instrumental in recruiting, training and establishing the chapter. He has continued to assist, most recently with facilitating the strategic planning process, and his involvement at the provincial and national levels has been invaluable. In Scott’s professional life, he is Vice President of New Product Development and Food Safety at the Star Group of Companies. His expertise in leadership management has been a good complement to his work with search and rescue. Scott can relate to many search subjects, having experienced being lost for five days by himself in the Alaska wilderness while bringing 25 horses back from a remote hunting camp. He lost his pack horse (which was carrying the map), his GPS had long run out of battery power, and snowfall and bears were a concerning factor. Compass skills and getting back to the basics helped him find his way out of trouble. 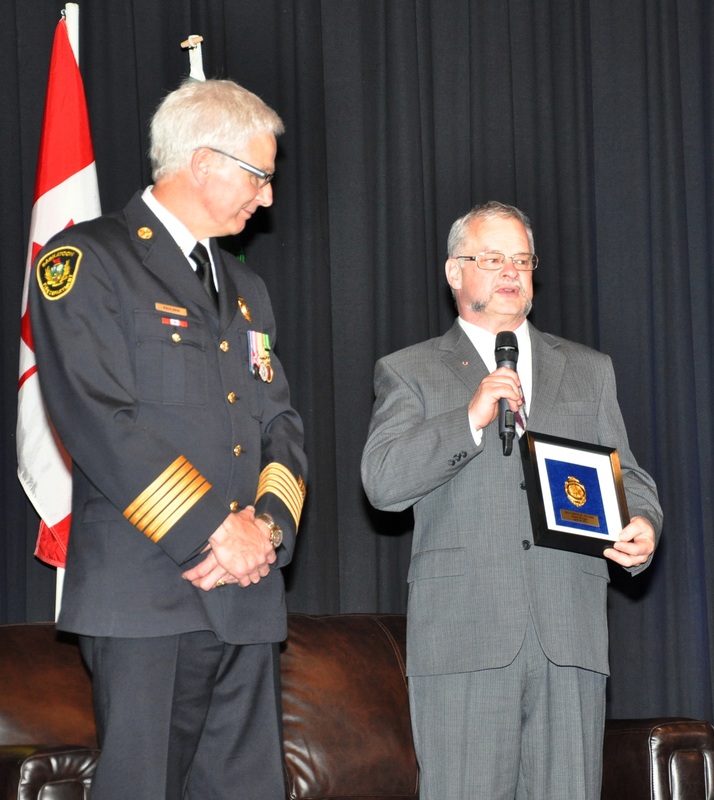 Scott accepts the Shield Award from Saskatoon Fire Chief Dan Paulsen at the Badge, Shield and Star Dinner, April 10, 2014. Well done Scott ! Recognition is one of the simplest and genuine ways, to show everyone that your efforts were appreciated . I salute you and all that you stand for !! Congratulaions Scott! A well deserved recognition! AWESOME Scott, what a remarkable achievement !! Congratulations Scott , could not have gone to a more deserving person who has dedicated so much of his life into a organization that he truly believes in. An excellent write up about a dedicated and most worthy recipient. Scott, my hat goes off to you. Thanks for all that you have done, and continue to do, to advance SAR locally, provincially and nationally.